Congrats. You can pickle myoga for later. I think I lost the myoga I had. It is hard to get unless you know somebody, they will not grow from the flowers only the rhizomes. If you grow ginger from the market they have to be relatively fresh and plump. The main harvest of ginger is coming soon. Ginger early in the year are young ginger, good for pickling but not for growing. I still have ginger in the refrigerator I harvested last season. It lasts a long time. 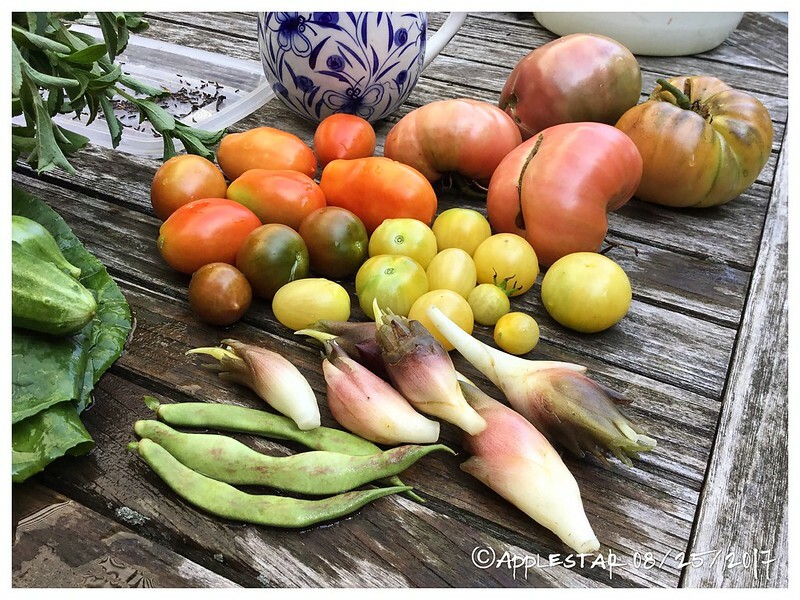 Myoga got a jump on me when I harvested them yesterday -- almost all of these had first blossoms that bloomed. The delicate blossoms only last one day then turn into mush, so I had to process them right away. I decided to cut off the pointy ends about 1/3 of the way down to pull out the blossoms, then freeze just the blossoms in a ziplock sandwich bag. They are good as salad garnishes and adds delicate flavor to clear Japanese broths -- osuimono. I cut the Myoga in half and sprinkled sea salt, then squeezed out some of the moisture that came out (I think this takes out some of the bitterness, just like with eggplants and cucumbers. The process also helped to get last little bit more dirt out from between the layers.) then minced them and added akashiso vinegar, lemon juice, mirin, a bit of soy sauce (about 1/3 of the original recipe), bonito flakes, tahini, roasted sesame oil, and unsulfured molasses. This was excellent freshly made -- thick with tahini -- on rice. I imagine it will be somewhat watery today. I need to make some rice so I can have a taste. I bought myself a plant of myoga this year and have it in a large pot on the terrace for the moment. My hardiness zone is 9a so could I leave it out all year round or will a couple of days at -4C in the winter kill it off? We have about a week of consecutive overnight lows around -20°C (-5°F) in the depth of the winter here, so I think it should be OK to handle -4°C, even in a container. If in doubt, I would place it inside a larger pot or maybe wooden crate and fill the space around the pot with leaves, straw, or other insulation. -20°C! That'd be a natural disaster here. Anyway its reassuring to know. I'll keep it in a pot for this year and then when I divide the plant I'll find a spot in the garden for it. 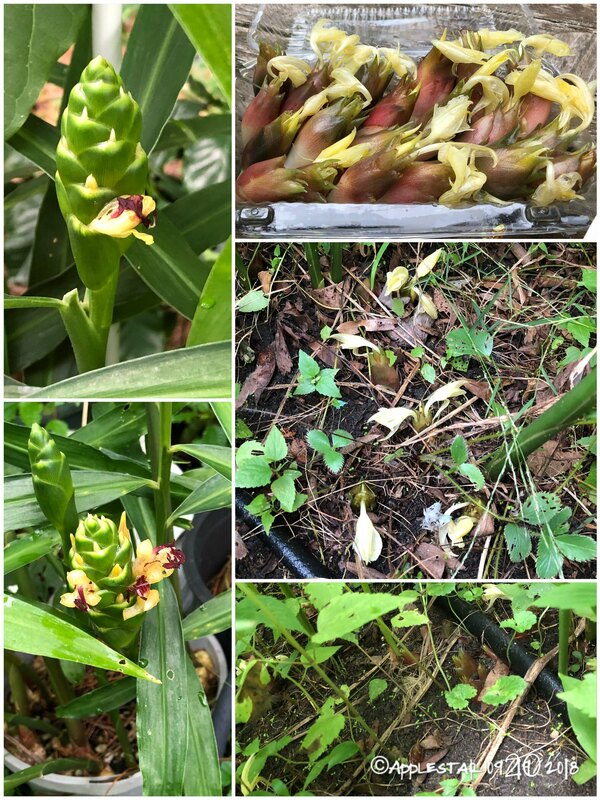 I started clearing the weeds around the myoga (Japanese ginger) patch and discovered they have already started to bloom from the sunniest side of the patch. 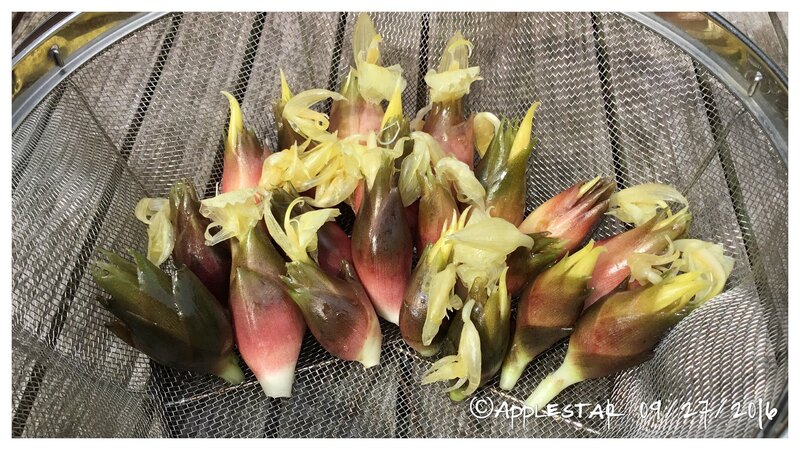 You only eat the flower buds (preferably not yet blooming) of Japanese ginger, although the delicate flowers are great garnish that can be enjoyed if you grow them. 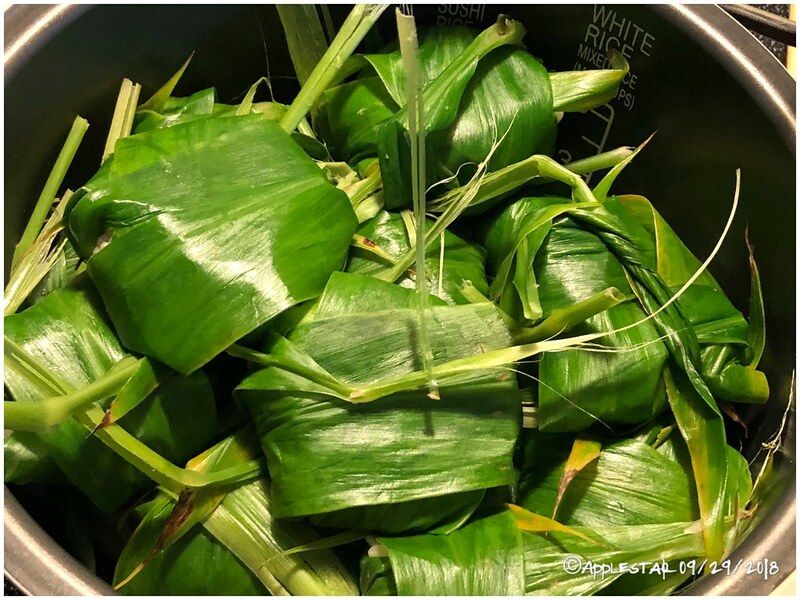 The fragrant and antiseptic leaves can be parboiled and used to wrap and cook foods or to serve them. 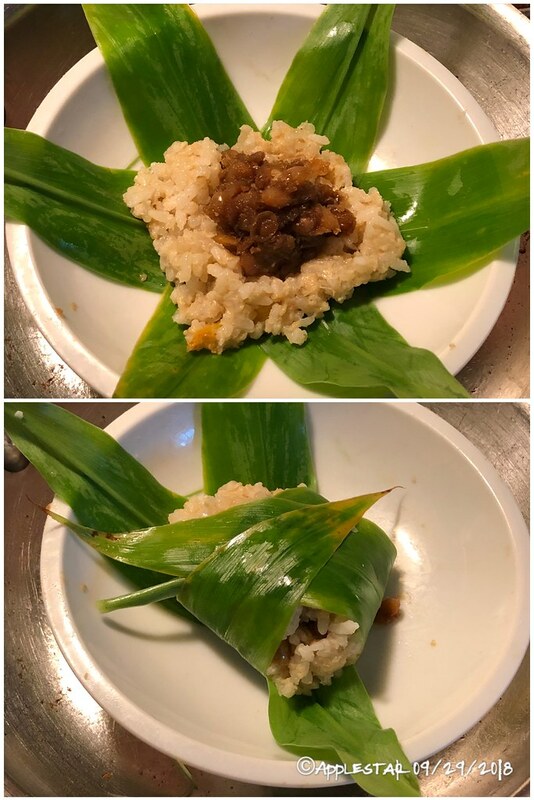 I just found a recipe for making myoga leaf wrapped, steamed sweet rice flour dumplings filled with white bean jam filling. 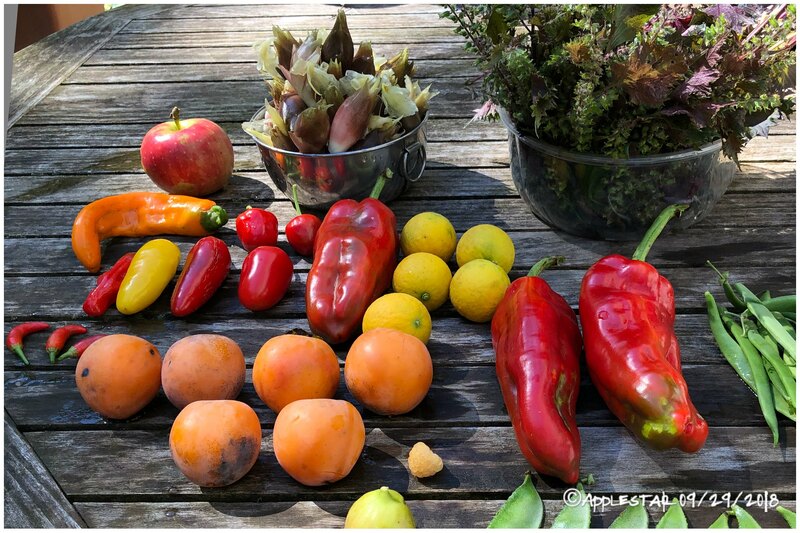 Since the part you harvest are the flowerbuds which emerge from the ground at the base of stems, you have to push those leaf stalks aside etc get at them. And the bruised leaves smell absolutely wonderful. I knew you can put the stalks and leaves in baths and use infusions for bath /personal care products. This year, I was delighted to learn that there are also some regional specialty summer sweets in Japan made with the Myoga leaves as the wrapper. After consulting several varied recipes, I decided to adapt from them and make up my own. Instead of sweet and regular rice flour dough, I decided to use soft-cooked sweet and white rice, and worked in some whole wheat flour and added fully ripened persimmons since this fruit is also in season. For the filling, I used the beans I had on hand, and opted for navy beans over adzuki. Navy beans cook up with mild flavor and tender bean skin that is even softer than adzuki bean skin.so you can lightly mash the sweetened beans but leave some of the beans whole without noticeable mouthfeel.